To evaluate our add-ins, please download and examine the PDF Guide file and the XLSX Example file. To download a PDF or XLSX file, click a link shown below. To buy a license with a risk-free 30-day money-back guarantee, browse to the product page for TreePlan, SensIt, SimVoi, or ToolKits. You will be able to download the software ZIP file several minutes after you complete the purchase. Except where noted below, the following PDF files are selected chapters from an unpublished manuscript, Decision Analysis Using Microsoft Excel, by Michael R. Middleton. Click a link for information related to TreePlan, SensIt, and SimVoi. A histogram in Excel is usually a Column chart type. The labels of a Column chart are aligned under the center of each vertical bar, and there is no Excel feature for changing that alignment. For continuous-valued data, a better histogram has a horizontal axis with numerical labels aligned under the tick marks between the bars as shown below. For detailed installation instructions, download the How-To-Install-Addin PDF file. 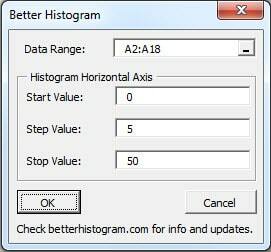 Before you use the Better Histogram add-in, please use Excel’s MIN and MAX worksheet functions to determine the minimum and maximum values of your data values so that you can decide on “nice” intervals for your histogram.